Malaysia, 18th April 2016 – Far East Hospitality (“FEH”), Singapore’s largest operator of hotels and serviced residences opened Oasia Suites Kuala Lumpur in the 2nd quarter of 2016. Oasia Suites Kuala Lumpur is the first hotel under the Oasia brand by Far East Hospitality to debut outside of Singapore. Located within the Kuala Lumpur Golden Triangle with easy access to the city’s key business infrastructure and adjacent to KL Forest Eco Park, the only surviving virgin tropical rainforest in Kuala Lumpur, the hotel offers guests a ideal respite within the city and views of both the sprawling greenery and surrounding skyscrapers. A short 15-minute walk will bring guests to the nearest Bukit Nanas Monorail Station where public transport is available. A 2015 survey done by Skift on “What Business Travellers Prefer” showed that business travellers often compromise wellness during travelling: 38.7% of travellers sleep worse, 22.3% skip meals or resort to fast-food when they’re too busy, and 41.7% exercise less2 . Redefining and setting new standards to city hospitality experience as the destination of choice for wellness-conscious travellers in the capital of Malaysia, Oasia Suites Kuala Lumpur is a restorative retreat in the city that inspires and empowers guests to Journey Well when travelling through three wellness pillars -Refresh, Refuel, and Recharge. Housing a total of 247 rooms over two blocks, Oasia Suites Kuala Lumpur comprises 25 Superior, 59 Deluxe, and 79 Premier rooms, and 39 one-bedroom and 45 two-bedroom apartments. Facilities include a kitchenette, washing machine and dryer, living area and Wi-Fi connectivity, making the accommodation an ideal respite to refresh the mind and body for both transit and long stays. A unique feature offered by Oasia Suites Kuala Lumpur is the dual-key access system. This feature enables groups of guests to stay in one unit that can be divided into two separate but adjoined apartments within the same single unit, which is an ideal option that provides flexibility for groups of business travellers or families of up to 6 guests. All-day dining is available at the lobby restaurant, Kafe Oasia, with offerings of healthy and sumptuous international ala carte menu and daily buffet breakfast made from environmentally responsible sources to refuel guests. Guests may also look forward to seasonal menu changes with healthy options on a quarterly basis, providing new selection of dishes for guests to look forward to every time. 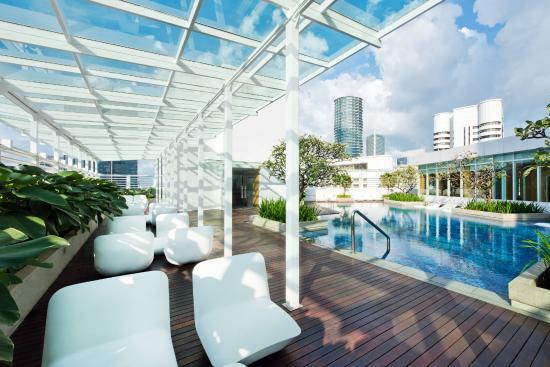 Escape from the hustle and bustle, and unwind at the idyllic rooftop garden that features a swimming pool surrounded by the spectacular views of the city located on the 24th floor. On the same floor is the 24-hour gym which provides a serene setting for guests to work out and recharge with state-of-the-art fitness equipment – all while overlooking a picturesque view of the Kuala Lumpur Tower. Business executives can also opt to utilise the meeting rooms for business discussions in a calm and comfortable ambience. The residents’ lounge located by the poolside is a pleasant space for guests to relax as it commands the dazzling view of KL City. Oasia Suites Kuala Lumpur is located at No. 10, Lorong P. Ramlee, 50250 Kuala Lumpur. Room rates will start at MYR400++ per night for a Deluxe Room. For guests who stay from 18 April 2016 to 31 December 2016, Far East Hospitality will be offering a pre-opening promotion of 50% off Best Available Room Rates. For bookings, please contact 1800 806 615 or email reseasy@fareast.com.sg.